It has begun. It’s officially the time to start with all of my food making for the holidays. I’m doing a couple of test runs for holiday gifts for friends near and far, and decided I would share early enough so that you all can make them up too. 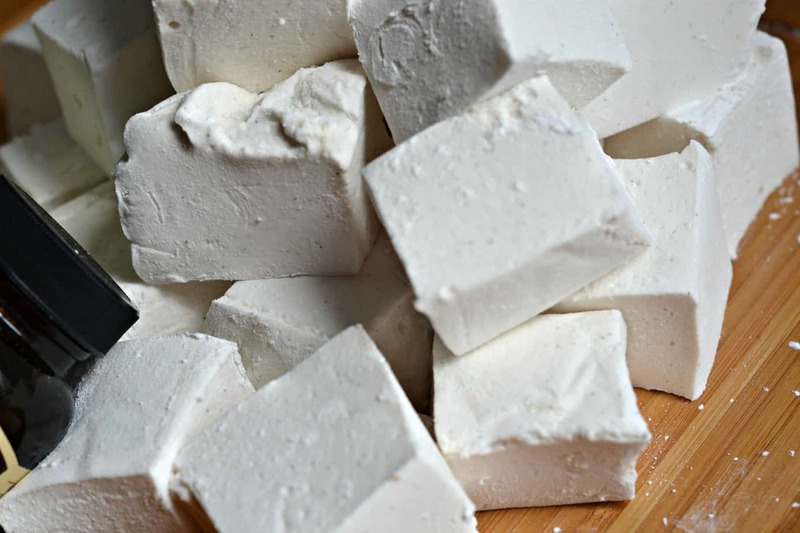 Today, I’m focusing on the sweetest of the sweet with these homemade vanilla bean marshmallows. These are super special because they are made with vanilla bean paste so you can see the flecks of vanilla goodness right there in the mallow. I’m so cool I shortened marshmallow to mallow. It’s what all of the homemakers are doing these days. In a large bowl, combine powdered sugar and cornstarch; set aside. Line a 9 inches x 13 inches glass baking dish with foil. Lightly coat foil with non-stick cooking spray; set aside. 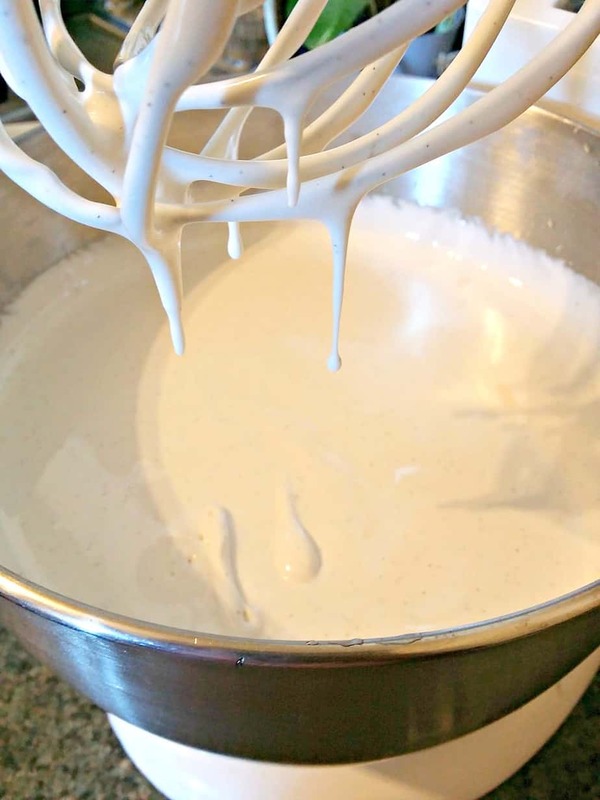 Pour 3/4 cup cold water into a large bowl of an electric stand mixer. Then sprinkle gelatin over water and let soften. Fit mixer with a whisk attachment. In a medium, heavy, deep saucepan, add sugar, corn syrup, water, and salt; stir to combine. Place over medium-high heat until sugar dissolves, about 3-4 minutes, stirring occasionally. Attach the candy thermometer to the saucepan and continue to cook until mixture reaches 240 degrees F, about 10-12 minutes; do not stir. Remove from heat. Turn mixer on low speed. Slowly pour a stream of sugar syrup down the side of the bowl into softened gelatin. After all the sugar syrup has been added, gradually increase the speed of the mixer to high and beat until mixture is thick about 15 minutes. Add Nielsen Massey vanilla bean paste during the last minute of beating. Pour marshmallow into prepared baking dish and spread evenly with a spatula; place in refrigerator until firm, about 3 hours. Sift half of the powdered sugar-cornstarch mixture onto a piece of parchment paper. Turn Vanilla Bean Marshmallow onto sugared surface and remove foil. Using a pizza wheel cutter, cut into 1 inch squares. Roll marshmallows in remaining powdered sugar mixture. Store in an air-tight container. Even at this point, the marshmallow was divine. Too sticky to form into molded shapes, but almost a silly putty consistency until it warmed up. After setting it in a rectangle pan lined with oiled aluminum foil overnight (but you can loosen it as soon as three hours) we were presented with this beauty. 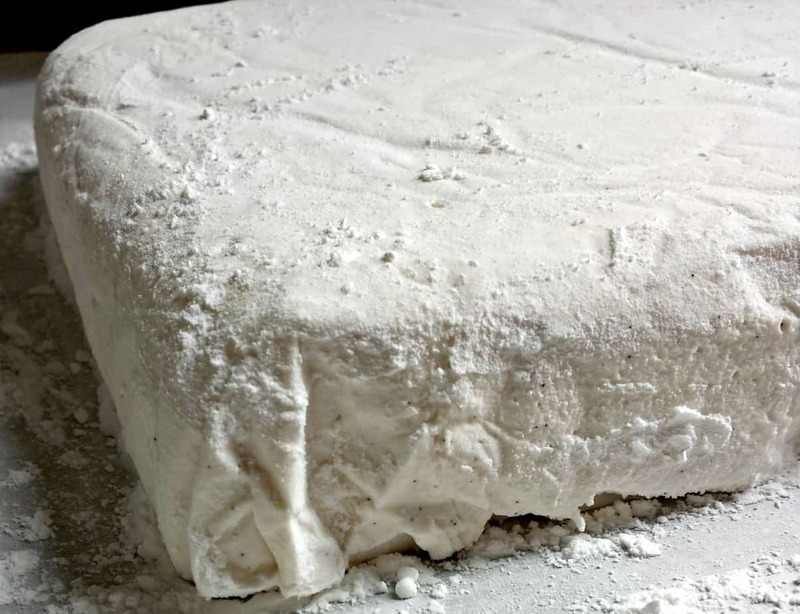 A 9×13 marshmallow loaf, ready to be powdered and cut into whatever shape I saw fit. Naturally, I chose squares, since these will probably be making their way into very rich cups of hot chocolate (that I’ll be sharing tomorrow on the blog) for those long chilly nights that are sure to hit Chicago soon. Not like that 77 degree weather we had yesterday. IN OCTOBER. I’m not complaining, but I am. Because that weather could have been saved for a day full of Trick-Or-Treating in general. But I digress. Can’t you see yourself chomping into these fluffy, gooey, and richly vanilla flavored squares of goodness? Just imagine them floating without a care in the world on top of a huge cup of hot chocolate. They’re almost too good to cover up with whipped cream, but you could add a dollop to round out the meal snack. This HAS to be the perfect way to start all of the holiday spirit building that you’ll need come Sunday. While searing online for that perfect gift for you honey, grab a marshmallow. While listening to Christmas Music on LiteFM, because you KNOW it’s coming – I’m pretty excited – grab a marshmallow. Roast some S’Mores on those fire pits that you want to get a bit more use out of before it gets TOO cold. FRESH MARSHMALLOWS. 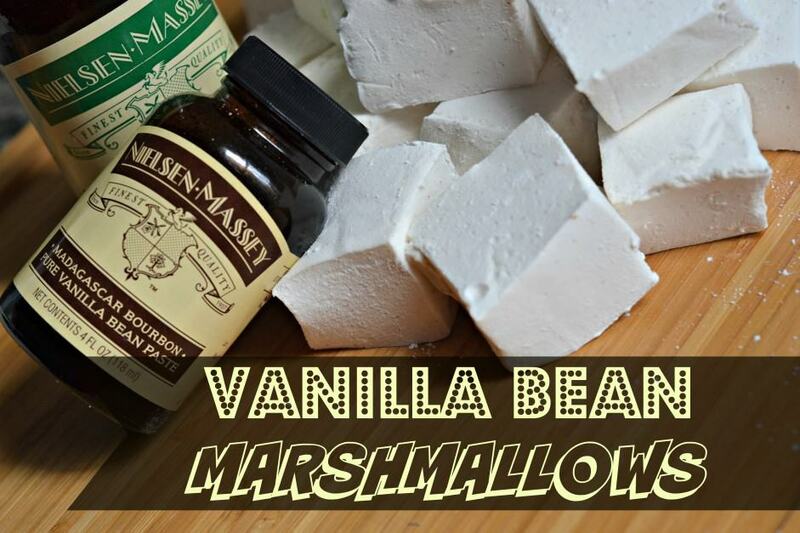 These can be put up against any bag of store-bought marshmallows, and I guarantee that they’ll win hands down. Why? Because YOU WILL HAVE MADE THEM! That gives you bonus points for sure. Now, go and make them, and enjoy one or four. You deserve it. 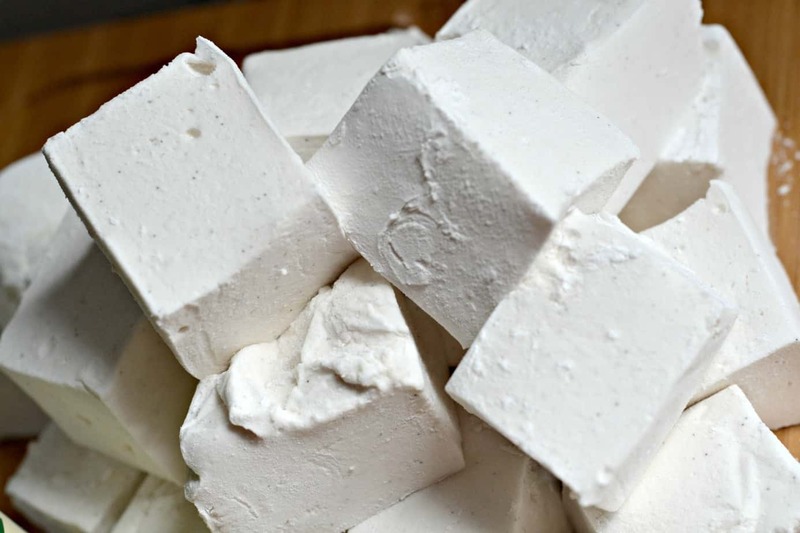 Homemade Marshmallows is the one thing I’ve been TERRIFIED to try. You have inspired me. I’m absolutely making these. I have all of the ingredients already. Yay!!! GIRL! The vanilla in that mix…I can just SMELL IT!!!! When I get a little time this season, I’m going to try this. Now to just let Mr. Knows It All that I need a candy thermometer! hmmm…. seems I’ll be making a trip to the market for some vanilla bean paste. Not something that’s found easily around here.